Looking for an alternative product and option for foot pads, for both women and men? Give Pure Sole Foot Pads a try! After 26 years of research, the Japanese Medical Department discovered bamboo vinegar and the great benefits it has to offer. A mature bamboo has an extraordinary ability to absorb 3-4 tons of water per day from the roots underground. From the years of research, high quality bamboo was put under high temperature for several days to create liquid bamboo vinegar, which demonstrated the same absorption ability. An advanced technology was developed to distill the bamboo vinegar liquid into a bamboo vinegar extract for commercial application and use. Results were combined with other essential ingredients and finally, the bamboo vinegar foot pad was created. ► MADE WITH 100% NATURAL & PREMIUM INGREDIENTS- The main ingredient of the foot pads are bamboo vinegar powder combined w/ Chitin and Chitosan, Tourmaline, Vitamin C, Vegetable Fiber and Minus Ion Powder. 1. Clean sole of feet. 2. Remove backing from the adhesive sheet. 3. Place foot pad in center of adhesive sheet. Writing on foot pad must face down onto adhesive, mesh surface shall be in contact with your skin. 4. Position patch on the sole of your foot. Remove second strip and smooth sheet. 5. Keep foot patch on for 8-12 hours. Pure Sole 100% guarantee: we strive to ensure our customers are fully satisfied with product and service. If not we will do all we can to make it right and ensure you are satisfied. PRODUCED WITH 100% NATURAL & PREMIUM INGREDIENTS - Our foot pads are sourced from top manufacturers that provide 100% natural and premium ingredients. Distilled bamboo vinegar powder is the main ingredient and source of all the great benefits that our customers experience . We pair our Bamboo Vinegar Foot Pads with additional ingredients such as Chitin and Chitosan, Tourmaline, Vitamin C, Vegetable Fiber and Minus Ion Powder. Sourcing top notch ingredients is our number one priority. EXPERIENCE THE BENEFITS OF BAMBOO VINEGAR FOOT PADS - Don't just take our word for it, but that of the many valued customers that use Pure Sole Bamboo Vinegar Foot Pads and their raving reviews. 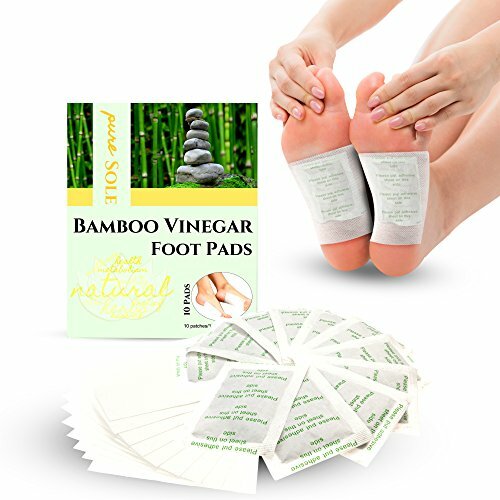 Looking for relief from a long day and results, you can count on Pure Sole Bamboo Vinegar Foot Pads. Bamboo Vinegar Foot Pads are appropriate for both Women and Men. QUALITY PRODUCT & EASY TO USE - Our Bamboo Vinegar Foot Pads are double sealed. Each pad is individually packaged for freshness, and is ready to use when needed. For additional protection, we package our Foot Pads in a resealable aluminized bag. No need to rush, use as needed and keep sealed for extended storage. Application is easy and you can let the foot pads do the work while you sleep. Follow instructions, apply before bed and wake up the next morning having experienced the benefits. BASED ON 26 YEARS OF RESEARCH AND SOURCED FROM FDA CERTIFIED MANUFACTURER - Bamboo vinegar is a result of 26 years of research in Japan, and the associated benefits continue to be studied. If the traditional isn't working and you are looking for an alternative. You must give Pure Sole Bamboo Vinegar Foot Pads a try. We search for top quality manufacturers and product and proudly work with a manufacturer that has 10 years experience and holds a facility FDA certification. 100% SATISFACTION GUARANTEE - Pure Sole foot pads are backed by 100% guarantee that you will be fully satisfied with your product and service. If you are not fully satisfied, we guarantee to make it right. We follow up with every customer to ensure any issues are identified and resolved. We want to make sure top notch customer service isn't lost through online shopping. If you have any questions about this product by Pure Sole of LK Commerce LLC, contact us by completing and submitting the form below. If you are looking for a specif part number, please include it with your message.